I travel to experience new things and feel how different it is like to live in a totally unfamiliar place. As luxurious or comfortable a resort can be, it isn't something out of the ordinary. I can get that same five star atmosphere anywhere in the world but that isn't what I am traveling for - unless of course, I am on my honeymoon or something. Living in a local listing lets me live life like a local citizen, sometimes with a local citizen. I get to make friends from that particular country and I even get to grocery shop at a local market to cook my own meal in the evenings, secretly imagining like I've migrated. Efficiency is important and when booking with airbnb, I couldn't help but notice how efficient the service was. As much as the level of efficiency varies differently on the host, the interface is super clean and easy to use. The information and details are being put up easily for you to read and although the initial booking process is a little (just a little) less straight forward than booking through an agency, once you understand how it works - trust me it's worth it. The Airbnb app on my phone makes it easier to send and receive messages from my host, manage my upcoming trips as well as view my previous trips too. Not only that, it is also a cashless and card less transaction. The payment is done through the app so there is no such thing as extra charges after checking out - unless of course you break something or burn the kitchen down. As a traveller, I have had incidents where I got the wrong information from asking locals. Whether it was a prank or a miscommunication, it is scary when you're looking for a well-known museum but end up in a shady alley reeking of beer. Having a host is extremely convenient because I get recommendations first hand. Most times, the host is a local or they have been living in that city for years. Either way - they know their stuff and they are not there to earn any commission because they aren't working for a travel agency. Recommendations that you get from a host are sincere, genuine and promising. Sometimes, they even have friends and would help you get cheaper deals. Win-win situation. When you're finding a place to stay in an unfamiliar place, you'd obviously be looking for some place safe. Same goes to the host. They earn money by listing their properties up for rent - which simply means that most of them are genuine, honest and would only want to do business with someone that they can trust. They would make the effort to ensure that you enjoy your stay in their property, yet at the same time trust you enough to lease it out to you. Pictures of the property are usually uploaded onto the listings. I get to view them in detail and even contact the host if I'd like to know more about how the area is. If a host takes too long to reply, do not have a verified account or do not have proper descriptions on their listings, I simply skip them. Hosts get awarded with badges if they are really good or are recommended by other travellers, and these are those that I know I can trust. Prices per night are stated on the page, together with any other additional charges (e.g. cleaning or service charge) depending on the listing too, which means that there aren't any hidden costs. The most important section for me to check out before confirming a booking is the reviews section from previous travellers because this, would say a lot. Every time I inform my friends that I've made the booking through airbnb, they will always ask me why I did not simply booked a hotel or resort. I don't know whether those were questions of insecurities or curiosity, but I never got around to answering them fully. However after the trip is over, I didn't even have to - they would already have the answer themselves because being based in a local neighbourhood made the trip better. As promised - perks. 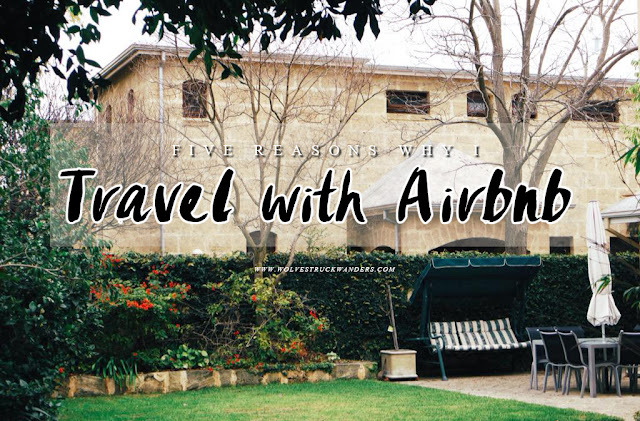 For any of your interested in traveling like me, simply sign up for an airbnb account and receive a SGD35 voucher from me, to use on your first trip. What are you waiting for? Adventure awaits!